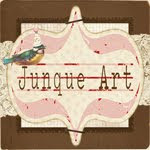 Hi and I hope you are all enjoying visiting Joli Paquet! I can just feel the excitement and want to thank you for taking the time to visit. I truly believe being creative is good for the soul and it is my hope you are getting inspiration here to be creative. 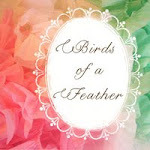 We all want to see what you are creating so please be sure and join the Joli Flickr Group and post your finished projects from any of our tutorials that have inspired you! 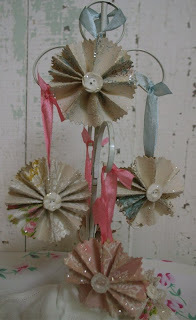 I started making these little vintage wallpaper rosette ornaments last year. I used them around my house and sold a few in my shop. Today I am going to share the tutorial with you. They are really super easy to make and look great on a tree, on a package, as garland, or just hanging here and there by themselves. Now I do them a certain way which I developed by trial and error. Please feel free to make the project your own. I might be doing it the hard way...LOL. 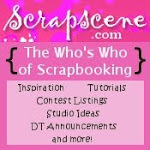 In fact I encourage you to make it your own and express your creativity! I will suggest certain products to use, but you can substitute what you have on hand. 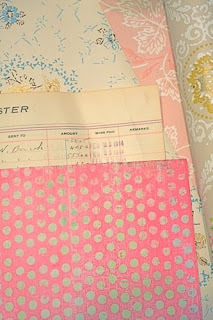 Today I will be using scrapbook paper for the tutorial photos but I love making them from vintage wallpaper as in the photos above. Before I start I will let you know this is my first ever online tutorial. I have a new respect for those that do tutorials online! I apologize ahead of time for my not so great photos but I hope you will get the idea anyway. So let's get started. I will list the step first and then the photos that corresponds to the step. Step 1: Pick out the paper you would like to use for your ornament. Step 2: Cut your paper approximately 3" wide x 10" long. This can really be any size, it will just change the size of your finished ornament. So feel free to experiment. 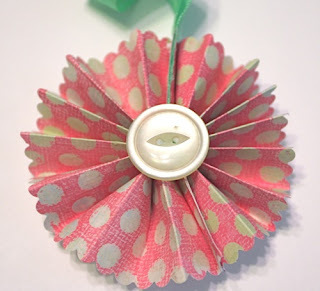 You can cut with your paper with a trimmer or scissors then use your decorative scissors to scallop/shape the two long edges. 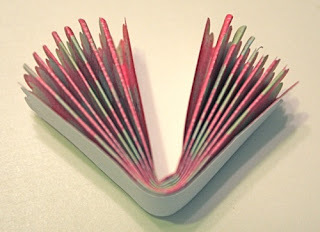 Step 3: Fold your cut paper piece into an accordion fold. Again you can make your folds any size. 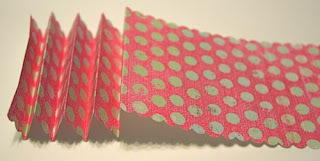 I make mine about 1/2" so that my ribbon will be covered up (see step 6). Step 4: Fold your accordion piece in half both ways and crease really well. Step 5: Tie about a 12" to 14" piece of ribbon around your folded crease. I just tie in a knot. 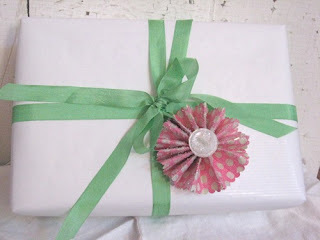 You can use any kind of ribbon but I love to use seam binding. 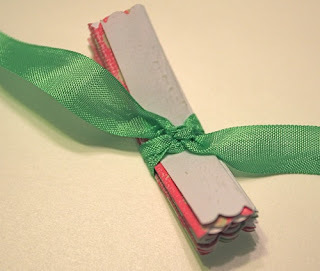 Step 6: Glue your ribbon down to the paper. This is where I use the Golden Gel Medium. This stuff holds anything! But please don't go out and buy it just for this project. Any craft glue will work. I actually tried double sided tape when doing the tutorial and it seemed to work. I would just be concerned about how long it would hold. 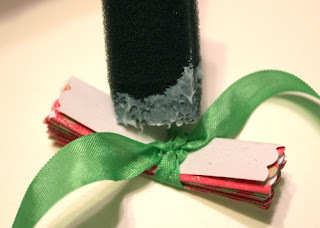 Step 7: Add more glue or tape on top of your ribbon. Step 8: Fold your two sides together so they will be glued together. 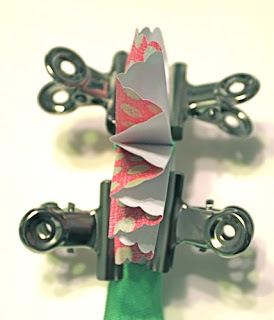 Step 9: Use a bulldog clip or clothespin to hold your paper together while it dries. 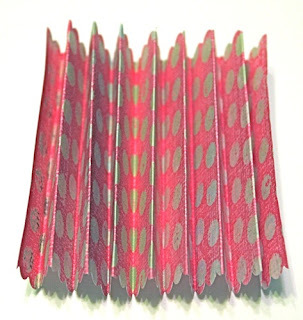 If you are using double sided tape you will not need to use the clips. Step 10: Repeat steps 6 through 9 (minus the ribbon) for the other side of your ornament. 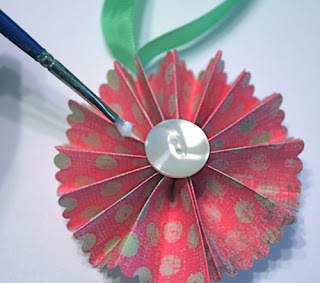 Step 11: If you are using the glue method you might want to add clips to the back of the ornament too. Now let your ornament dry. Once dry remove your clips. Step 12: Add a button with glue. 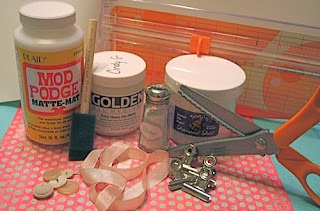 I use the Golden Gel Medium here too (any craft glue will do). Let it dry a little before you move to step 13. Step 13: Paint glue on the peaks of the ornament and on the button. I just use an old cheap paint brush for this step. You will want to go down the side of each peak just a little as this is where your glitter will go. 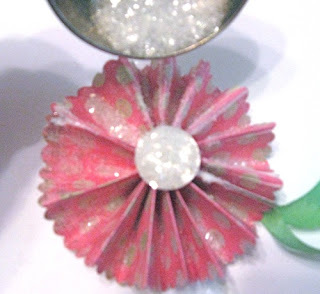 For this step I use Modge Podge but any glitter glue will work. Just make sure you apply a thin coat so it doesn't run down into the valleys of your ornament. Step 15: You are done! Now you can use your little ornament. Below I made a garland. I just tied the ribbon onto another piece of long ribbon. You could make it as long as you want. This would be great hanging down a stairway rail. I also tied one as a package ornament. Just add another piece of paper on the back cut in a circle. Then write the recipients name on it. Not only will they get the present but a handmade ornament from you! How cool is that? I hope you have enjoyed this fun little tutorial! I enjoyed putting it together for you! Please be sure and post your ornaments to the Flickr group. Should you have any questions please email me! Happy Ornament making and don't forget to sign up for the handmade stocking give away. Sign ups end tonight. I will draw a winner tomorrow. Thanks! First time or not, this is a great tutorial! Clear and inspiring! Cindy, your tutorial is perfect!!! the ornaments are darling, and your instructions are clear and so easy to follow...i will definitely be making some of these cuties!!! one of the best tutorials I've seen! Taking the time to show each step is wonderful! This turned out so cute! Those are soooo pretty & sparkly! Thanks for the lovely tutorial! 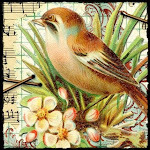 Cindy, the tutorial is easy to follow and sounds great! I LOVE using them in a garland. I can't wait to try this, I have the perfect spot. Thanks for the inspiration! I remember seeing these in your your shop last year and loved them. I will be adding these to all my gifts this year...Thanks so much!!!! Very easy to follow tot! OH Cindy! THank you so much for showing us how to do these! I have always wondered how and your tutorial is perfect!! 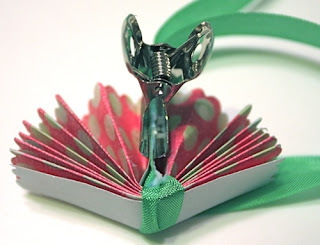 I am going to make some of these today! This would be a great project to the grands to help with. Thanks for the tutorial! 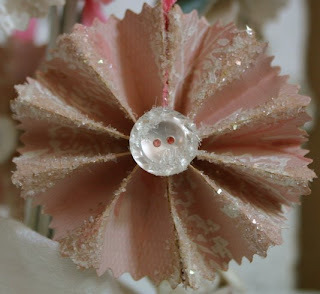 I like using them in a garland but will make some for package decorations too. Thanks so much Cindy for the tutorial! I love these little rosettes, and will be sure to sue them on packages this Christmas, as I have decide to go green, and handmade as much as possible this year. Thanks for helping me do that with these sweet little embellishments!!! Great job very easy to follow your steps :c} These will be fun to make and use as a quick fluff on a gift!!! Thanks so much. Great tutorial!! These are so sweet - I can't wait to make up a bunch!! Thank you! I'm going to have to try these too! These are the cutest! I can't wait to make them. And, your tutorial is super easy to understand. Your pictures are nice, too. Please post more; you have a knack for it! I thhink that you did the best tutorial Ive ever seen,. I alway shave questions after all the ones I see and with yours you just did it so well I have none...I got every step and im excited to make these! What a great tutorial! Thank you so much! A great tutorial, very clear. I love the little ornaments - they will make great package decorations! 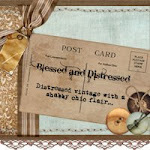 Wow, I have a craft day set up for Friday and this is going on the do make list. Thanks for the great tutorial!! It was perfect! Your photos look great! I like all the glitter on them. Cindy, thank you so much for the tut! 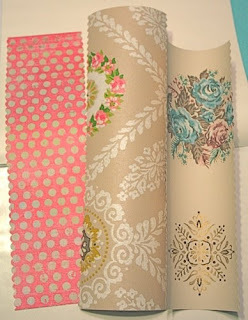 i can't wait to get started on these with some of my wallpaper stash. Jodi B. Beautiful! Love it!! Thanks for an awesome tutorial!!! Wonderful tutorial! The pictures and instructions are great! 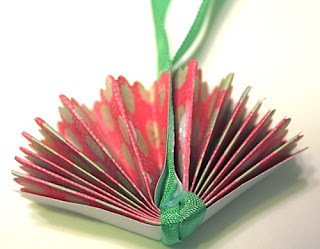 I can't wait to look through my paper supply and make some of these. 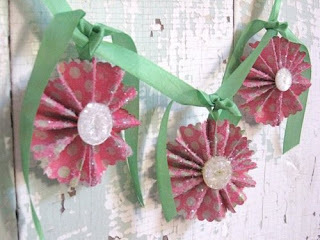 I also like the idea of the garland--so creative! Thanks for sharing! Joli Paquet is two for two! I have loved both craft projects and I am embarrassed to admit that I had no clue how either project was made until I saw the tutorials! Thank you for this wonderful experience. so lovely! Thanks for the fun tips! Oh how LOVE these little ornaments! I'm making a bunch for my holiday prezzies. Thanks for a perfect tutorial....really the best! Thank you so much!! This was a great tutorial and now I know what to do with my kids during vacation! 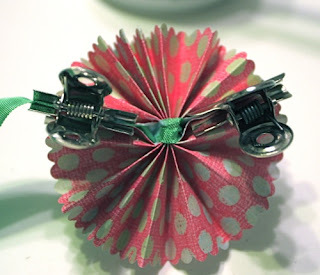 We'll use up a bunch of scraps and make cute ornaments!! Thanks for the great photos and details! Will make these for sure. Thank you so much for sharing this! The tutorial was great- easy to follow. You did a fabulous job! LOVE these little ornaments, Cindy! I'll be making a few of these, myself! ;) Great job on your first tutorial! Cindy....these are amazing. You have a lot of patience. Makes me feel lazy:) Are you selling them? I can go check. Elizabeth Williams sent me to your tutorial. Thanks so much...I just love these little bon bons! You have made a fan in me! Thanks so much for sharing the tutorial. I just made my first rosette. Your instructions were so easy to follow. Great job!! Thanks so very much for posting this quick, easy, and clear tutorial! I just followed your directions and whipped up several of these to us as gift tag and ornament ideas for my Christmas packages! Love this idea. Have a blessed holiday season! Love love love this!!! (and I thought I would not make any more ornaments this year...lol) I am going to try this one NOW! Thank you sooo much for the tutorial.